Well, rest in peace January. We had a good run, but now it’s over. Time to abandon your New Year’s Resolutions, everyone, and go back to the bad habits. What exactly were my New Year’s Resolutions again? Hopefully not ‘Improve your memory’, because in that case I’ve definitely failed. In actual fact, my resolution this year was basically just ‘2016 and then some’ (I originally wrote ‘2016+1’, but realised that’s just 2017, which I technically what everyone will be doing). I don’t mean ‘kill beloved celebrities’, though. Last year I took a leap towards unlearning my habit of thinking that progress can only be made in big steps. I spent a lot of time thinking that I wasn’t getting very far on the second Laslo Kane book. Partly because I managed to get my dates confused and was therefore under the impression Fallen on Good Times came out around five years ago. It’s more like half that. Taking around three years to write another book isn’t bad, in my opinion (assuming, that is, I get it finished this year). Even full time professional authors usually have a couple of years between books. Considering all my other commitments and time drains, I’m doing pretty well. The bigger issue was that I often didn’t make any progress because the task seemed so big that I couldn’t see the point in writing 100 words or so; in my mind each session should have been a few thousand or it wasn’t worth bothering to switch the computer on. But when you have a baby who could wake up at any second, you can’t guarantee that you’ll have a couple of hours of writing time. Thus, little got done. At the beginning of last year – downtrodden by the misapprehension that it had been four or so years since Fallen on Good Times had been published – I decided I needed a change of attitude. And so I vowed to do whatever, whenever. I forced myself to view even a single extra sentence as progress. On occasions I wrote just 100 words before closing the document; on others I wrote several thousand. It worked. On New Year’s Day 2016 I already had around 30,000 words of book II written. By New Year’s Day 2017, the word count had risen to 110,000. I wrote 80,000 words last year, all while learning to value every word typed as a little victory. Fallen on Good Times is just over 65,000 words; so just in terms of word count I wrote more than another book. It just goes to show that making glacial progress is much more effective than making no progress. I was genuinely surprised last year when I realised just how much I had managed to write. So my resolution for this year is simply to take that attitude and try and keep at it. I’ve had lots of dormant projects lying in wait for me to have the time to pay them attention. I don’t think I’ll ever have ‘the time’, but from the outside I didn’t really have the time to write 80,000 words last year. I still did. 2017 will be another year of chipping away. Even if I end the year only having added a hundred words or so to each of my other projects (or the equivalent of a hundred words if it’s not a writing project), that’s still an achievement. Then again, January’s over now. Who keeps their New Year’s resolutions past January? February is the month of ‘Drink a Pint of Cigarettes While Eating Pizza in Your Old Job’. A few days ago I broke through the 70,000 word mark on the follow-up to Fallen on Good Times. It’s really opened my eyes to what you can achieve when you chip away at something a little bit at a time. What always held me back was the sheer size of the task ahead of me. Every time I would sit down at my computer, or think about working on the book, I would simply realise just how many tens of thousands of words were required from me and give up, overwhelmed by the scale of it all. But since Christmas I’ve been reinvigorated. I started 2016 with a very old draft of the book that was about 30,000 words long. Simply by adopting the philosophy that writing even 100 words was better than writing nothing, I find myself now having averaged 10,000 words a month and well past the halfway point. I’m currently in the middle of writing one of the key scenes in the book – a scene which I’ve been visualising for over three years now. It reminds me of that Lao Tzu proverb – overused, but incredibly accurate (as cliches often are) – ‘a journey of 1,000 miles begins with a single step’. I’ve begun building up momentum now, driven by the fact that not only am I approaching the finish line, but also the realisation that the finish line has moved closer towards me. If you read this post on the fact that book II is going to be a very long one, you’ll know that I estimated the final word count at around 135,000 words. I arrived at that number by dividing the amount of words I had done so far by the number of plot points I had completed writing, then multiplied that by the total number of plot points in my synopsis. Well, as I progressed through the synopsis, I realised that in shuffling scenes around I’d accidentally duplicated five of the plot points. This takes the synopsis down to 40 key developments, which has had the effect of shaving about 15,000 words off the projected total. All of a sudden, I’m excited again. I’m no longer just trudging along, reminding myself of the big picture (that one day I’ll turn around and give myself a damn good kicking over the fact it’s taken me four years to write another book, all the while lamenting the other volumes I could have written if I just had the discipline and the motivation). Now, I’ve begun to think about the finished book: about how exciting it will be to market another volume; to hold the finished novel in my hands; to put on the shelf with my other work. I’ve started dreaming up ideas for book trailers and other such promotion. But it’s not that I’m getting ahead of myself: there’s still a long way to go before I’ve even finished draft one, let alone the extensive edits and reader feedback that are going to come before this book is ready to go. This foresight is not jumping the gun, it’s simply the by-product of enthusiasm. It’s similar to the way in which you speed up the pace of your reading as you reach the most tense part of a novel; you aren’t wishing it away, you’re simply eager to see how it unfolds. Plus there are lots of things that I didn’t get to do when marketing Fallen on Good Times, which I’m excited to try out for book II. I’m also interested to see if the simple act of having two published novels will improve my sales (it couldn’t make them any worse). First of all, no, this hasn’t happened to me. Second of all, damnit. It’s a fact of modern life that we will come across attempted scams scarily often. So it’s no wonder that Helen Garner, an Australian writer, initially ignored an email attempting to contact her about a ‘prize’ that she had supposedly won. Most of us get dodgy emails with alarming frequency. I get five or six a day thanks to the fact that my email provider has an open prison with Japanese Shoji walls. An email supposedly claiming to be from someone at Yale University, who needed a phone number to contact with the ‘good news’, seemed to Helen to possess all the hallmarks of a classic spam message. Especially considering some of the attempted fraud these days is incredibly sophisticated, although mostly it does seem that criminals still rely upon error-ridden messages purportedly showing you the key to making £1 million in a year working from home, or medication promising to make bits of you work like they used to, or better than they currently do. Luckily for Helen, she double-checked with both Yale University and her publisher. It’s a good thing she did, as it turned out that the ‘scam’ message was in fact from Yale prize director Michael Kelleher, attempting to inform her of the $150,000 (£107,000) literary prize she had scooped. On top of Helen Garner, eight other writers won the Windham-Campbell prize, a literary accolade setup using a monetary gift from late writer Douglas Windham, to celebrate the memory of his wife, Sandy M Campbell. “I thought it was ‘Congratulations, you’ve won a cruise to Florida if you pay $200’,” Hannah Moscovitch explained. At least two of the other writers, Abbie Spallen, an Irish playwright, and Hannah Moscovitch, a playwright from Canada, were initially dubious about the validity of their congratulatory emails as well. Had Abbie deleted the voicemail without listening to it in its entirety, or Moscovitch ignored her message, they too might have missed out on $150,000. The Windham-Campbell prize differs somewhat from a lot of other literary accolades in that there is no entry process and it is judged anonymously. I personally like this, as I think I would find it a bit hollow to win an award for which I’d have to nominate myself in the first place (although I’m bound to put myself forward for some in the future – you got to spread the word somehow). Because writers don’t have to enter the competition, those who win have no idea that they have even been shortlisted. With so many literary prizes out there, it is unsurprising that many of the winners have never heard of the Windham-Campbell prize. I’m glad these writers made the right judgement call (and naturally quite jealous). For many of them, the prize-money gives them the chance to write full-time, giving them a great – and obviously well-deserved – opportunity to take a part-time job and turn it into a career and their life’s focus. On that note, I better go check my spam folder again. There’s a man claiming I won the Nigerian lottery, a prince who wants to send me £2 million because he’s got too much money lying around, and a woman who wants to… Well, never mind. As a writer I spend a lot of time making people. They are all fictional, and it is my job to make you think otherwise. I have to make them feel real, bestowing flaws and talents, wants and desires, fears, shortcomings, relationships, and perspectives upon them to do so. I have created many fictional people, some published, some not. But recently things have been a bit different. There’s a new person in my life: I didn’t make them up, but I am partly responsible for their existence. A few weeks ago my fiancée gave birth to our first child, a baby boy. Logan. Logan at two days old. He looks pretty inquisitive already, doesn’t he? From idle chatter around campfires as a young boy, through teenage speculation at sleepovers, to the nine months of pregnancy, I have had plenty of time to ponder what it means to be a parent. I thought I had a pretty strong grasp of it. You see people doing it all the time, after all. I’d considered all the nappy changes, the getting up late at night, the calming him when he cries. What I never really understood before he was born is that Logan, right now, is pure potential. The day-to-day reality of his life may mean nappy changes and feeds and taking him in the pram to make our way through an assault course of grannies, but his existence – which is a much bigger thing – is full of ‘What if?’ Because my true role as a parent is to help him become the person he is meant to be; gently leading, but never pushing, guiding without forcing, enabling, not constricting. Logan can be anything he wants to be. That’s not an empty sentiment, similar to what you might find in the average ‘motivational’ Facebook meme. It’s pure fact. His life can go anywhere. When I look at Logan, I am constantly astounded by the experience and growth he is facing on a daily basis. Currently his eyes can’t focus, he hasn’t got the strength to hold up his own head, and he doesn’t even know that his arms and legs are part of his own body. He is a person, but such a tiny one, a seed ready to grow into something we can’t possibly imagine (but, not in an evil overlord kind of way. Probably). Without stimulation, Logan’s brain won’t build the bridges it needs to discover a world of amazing possibilities. That’s right, I did a metaphor. In the first few years of his life, Logan will create 700 to 1,000 neural connections every second. It is up to us to stimulate him into forging those connections, to create bridges between cells that give him access to greater function, new experience, and different ways of being. Each connection made is like lighting a candle in the dark, shining a light on a small part of a new future. The more we work for him, the greater his future will be. For all my efforts in fiction, I will never create a character as complex, nor as beautiful, as him. Liked my musings? Follow my blog for more of this sort of thing. Plus jokes. I was out and about the other day when I bumped into a lady handing out flyers advertising the Penzance Literary Festival. She asked me whether I was interested in literature, which provided me with a slight problem. Obviously, as a writer, I am very interested. On the other hand, I didn’t want to have to tell her that I was a writer. It’s not that I’m ashamed. It’s just… How exactly are you supposed to say without it sounding pretentious? Festival Lady: Are you interested in literature? Rewan: In fact, I’m a writer myself darling. I might as well have just put on a big puffy shirt, stared past her into the middle distance, and stroked a rose carefully against my cheek. I don’t know what it is, but the phrase ‘I’m a writer’ just sounds a bit arrogant. Not Kanye West arrogant, but nothing comes close to that. Ironically, if Kanye had finished his Glastonbury set by declaring he was the most arrogant man in the world, he would have been entirely justified. I think the problem I have is that anyone can be a writer. Maybe that’s why I got bored of telling people about it. Most people, at some point in their lives, have tried to write a novel. Usually what happens is that they spend several months declaring to anyone who will listen that they are going to write a novel, and spend a while collecting together various novel writing paraphernalia. (As much as I love Michael McIntyre, the opening of his autobiography where he discusses the fact that, knowing he had a book to write, he went out and bought himself an Apple Mac to write it on, did make me hate him a little). Because we can all write, and we can all string words together in some form or another, the simple act of writing anything makes one a writer. There is a very low threshold of acceptance, which so far has only worked to keep out grizzly bears and some of the cast of TOWIE. Is not that I don’t think anybody should be able to have a go at writing. I’d just like there to be some kind of quality control. So when I’m telling people I’m a writer, I feel as though I might as well be expressing some equally obvious fact, such as ‘I have legs’, or ‘My nose has never fallen off’. Writer is not quantifiable, in the same way as, say, Olympic gymnast. Just like anybody who went through the education system, I’ve been on a pommel horse and a trampoline, but that does not make me an Olympic gymnast. But if I own a pen, and have told somebody that I have vague intentions of writing a novel or a collection of short stories or an epic poem, what is there to say I am not a writer? Perhaps we could do with some kind of ranking system like they have in martial arts? That way at least if people asked, it would be a lot easier to explain. Rewan: I am. In fact, I am a Yellow Belt at writing. Festival Lady: Congratulations. How did that happen? Rewan: I stabbed three ninjas to death with a fountain pen. Festival Lady: I think your analogies are starting to bleed into one another. I don’t get this way when talking to my business clients. Copywriting is very different. It is certainly not something you can just claim to do (not for very long anyway, when everybody realises you’re terrible at it). I got a business and everything, with cards that have my name on and stuff. And I have plenty of clients who will attest to the fact that I am, indeed, a copywriter. But when it comes to fiction, it’s different. Other than carrying my published works around with me, there’s nothing to distinguish me from the person who sits on Facebook month after month giving updates about the novel instead of actually writing the damn thing. I think the next time somebody asks me, I’ll just tell them I’m an Olympic gymnast. A Black Belt Olympic gymnast. Next year Laslo Kane will be returning in another paranormal comedy that mixes gangsters and ghosts, trilbies and terror. I’ve been plotting both on paper and in my head, and have recently passed the 10,000 word mark on the first draft. It’s always great to get back into the creative side of writing. The last few months of Fallen on Good Times were about fine tuning, editing, and marketing. It’s a very binary process, involving reading the text through until my eyes bled, looking for mistakes, inconsistencies, and continuity errors. You always love the book, the story, and the characters, but it wears a little thin. So to be sitting facing an empty Word document, with nothing but a blinking cursor and a head full of ideas, makes for a very nice change. Hitting those important marks does remind you how far you have left to go, but that’s half the fun. Anything could happen in the other 70,000 words. My writing process is very loose and flexible, so I get to discover the story as I write it. It allows me to have the same experience as you will when you have the finished copy in your hands or on your Kindle. I know roughly what it’s about, but I’ve already digressed from my plot outline in the first 10K, so I have no doubt even I’ll be surprised. You definitely will. This one’s weird. That much I can already promise. It’s hard to believe it has been over a year since Personal Novel published Death at Castle Spire. Since then I’ve been working away at a second befuddling mystery. I’m pleased to announce that Mystery of the Sands, my second novel for Personal Novel, is now available for you to customise and buy from their website. Your first night as a security guard may not go quite as quietly as you anticipated. The central exhibit of the museum is an entire court of Egyptian mummies. One of them holds a terrible, murderous secret. When dark magic brings the dead Pharaoh and his court back to life, it’s up to you to solve a 2,000 year old murder – before you become the next victim. Personal novels are stories in which you and your family or friends take on the central roles. Have your own names printed in the text, set the story in your country, sometimes even your home town. Experience the excitement of an adventure, a mystery, or a romance with you at the heart of the tale. Will you survive? Will you be victorious? Will your every desire be fulfilled? There’s only one way to find out – order your personal novel today, and get reading. 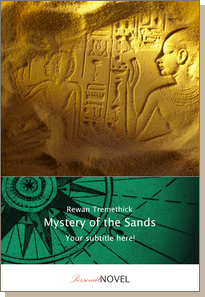 Mystery of the Sands is available in both printed and ebook format. Your printed version can be ordered in a range of formats; paperback, extra-large paperback, hardback, and linen bound. You can personalise the front cover colour, image, and subtitle, add a dedication in one of several font and colour options, and change the font of the main text. Printed with your names in place of the characters’, you’ll receive a novel that is completely unique to you. You can find out more about Personal Novels here. You can buy Mystery of the Sands here, and Death at Castle Spire here. Click the Thumbs up button to go to my Facebook page. Follow my blog by clicking the ‘Follow’ button, or entering your email address in the subscribe box. Yes, it’s almost that time of year again. The time of year when blog posts across the internet begin with the phrase, ‘Yes, it’s almost that time of year again’. NaNoWriMo (National Novel Writing Month) will be upon us in just over a month’s time. It’s the highlight of the writing year for many of us, but rather like an irresistible chocolate cake filled with nails, the rewards often come with a lot of pain and tears. Lots of people see NaNo as a challenge they are doomed to fail. They give it a go, but for many writers, the end goal of 50,000 words in one month is just too demanding. Some people will have too many commitments in the form of work or those small humans that require lots of attention. Those who do complete it may find that, come December 1st, their momentum and drive give out completely. For those who have the time and the drive, here are my five tips for getting through NaNo successfully, and making use of the novel you have created in that time. Not all of us are plot writers, and not all of us like to plot. But if you want to complete NaNo with a novel you can do something with, having some sort of framework really helps. It doesn’t have to be a document of 10,000 words, or a mind map on a piece of paper that takes up several acres. Just a single page of rough ideas is enough to help give you some focus. NaNo is all about writing fast, so having to pause for a few days to figure out in which direction you want the story to go is the worst thing that could happen (barring alien invasion, but that doesn’t count). Being able to write when you know where the story needs to go makes it much easier to get those words out onto the page. We’re all different, so in order to maximise your output, you need to find the way to write that makes things easiest for you. Whether that’s in a shed at the bottom of the garden, a café, the loft, or a small nuclear submarine at the bottom of a duck pond, taking some time before NaNo to work out where and when you write best will give you a boost in productivity right from the start. Something as simple as writing in a different room to the one you spend all your time in can drastically affect your discipline. Cafés are a classic choice, but remember that it’s not about appearing to be a writer, it’s about finding your own rhythm. Try different ways of writing as well – pen & paper, laptop, tablet, phone – to find the most comfortable and productive for you. Thinking about the future of your novel can help you keep your focus during NaNo. Knowing the future of it makes it much easier to focus on the end goal. Having a particular publisher in mind (whether that be a large international publisher, a small indie publisher, or even yourself), can allow you to see your novel as something that needs to be finished, rather than a hobby project. Publishers don’t like unfinished novels (many of them don’t seem to like finished novels either), so suddenly you have greater motivation to actually get it done. It can also help if you find yourself stuck at an important moment, where the story could go in one of several directions. Thinking about what your target publisher likes could make it clearer which choice is best for your story. This goes without saying really, but you can’t finish a novel if you aren’t writing it. As long as you persevere, there is a huge amount of potential for your book. If you give up, there’s only one thing it will be; unfinished. If you know you aren’t going to make the 50,000 word target, set yourself a more realistic one. Make it still slightly unreachable, though, otherwise there won’t be a challenge to get you motivated. Successful people are the ones who become more determined at the moments where others give up. Think positive, and focus on doing the best that you can, even if it means you don’t complete the challenge. A lot of people finish NaNoWriMo with a completed novel only to put it in a drawer and forget about it. After the intense focus of the writing challenge, they have no idea what the next step should be. You can keep your project moving forwards, and your determination strong, by already having a post-NaNo plan. Schedule a couple of weeks away from your novel, then spend the run up to Christmas reading through it, for example. Plan redrafting time, editing time, finding Beta readers and getting their feedback, which agents and publishers you will query, and the time it will take to submit. NaNoWriMo is a great way of achieving that dream of finishing a novel. With the right advice and determination, you can achieve the target and make a success of your finished project. Be tenacious, be pig headed, don’t come out of your room ‘til it’s done, and enjoy it. The content of this post is copyright © Rewan Tremethick 2013.